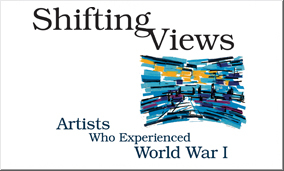 Peaceful landscapes, busy city streets, linear abstractions, portraits of friends and family– these paintings, drawings, and prints were created by twenty-three artists who experienced the frontlines of World War I. The artists represented served on both sides of the conflict – German/Austrian and British/American. Many believed in their country’s cause prior to their service, but had a very different perspective after experiencing war firsthand. Seen together, their works of art convey a shared sense of humanity in contrast to the divisiveness of war.